Originally, the word "trawler” referred to American fishing trawlers that were converted into leisure craft. They were traditionally spacious and fairly heavy with a limited speed of displacement and their rounded hull caused uncomfortable rolling. 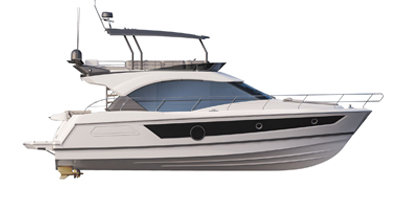 When Beneteau decided to launch their Trawler programme in 2002, their goal was to reinvent the concept completely. The new range would make the most of the traditional Trawler's seaworthiness and space, while offering greater speeds and performance, as well as new comfort. With this in mind, they set themselves the goal of adding the word “swift” to the word "trawler”. Heading up the development of Beneteau’s new boats, François Chalain convinced an architect who was an expert in sailing yachts and ocean cruising to step up to the plate. In September 2003, the first Beneteau Swift Trawler made a memorable début in the nautical world and was soon to win over seasoned boaters. Since then, over 1,000 boats have been produced and the launch of the new Swift Trawler 47 in September 2018 marks the 15th anniversary of a line whose success is growing. Now led by Thomas Gaillard, the Swift Trawler developments are based on staying constantly in tune with owners and dealers, as well as vigilantly watching out for basic trends in housing, architecture and design. Product manager of the Oceanis and Sense range for several years, I now work exclusively on the development of the Swift Trawler range. It is a wonderful opportuning to develop such a mature range, since we are building on very solid foundations. The concept’s excellence is now well-established, for its seaworthiness, speed of displacement and cruising range. This has positioned the Swift Trawler as a market leader. So, we can focus our research on a large number of details that make a difference to life on board. "I have been sailing since the age of 3 and cruising is pretty much the story of my life!" Swift Trawler owners now form a community of boaters and cruisers, and they are very generous in what they share with us. Most of them use their boats much more often than the average boater and they customize them with fittings tailored to their needs. They are often proud to take part in the development of future models, telling us their story and giving us a glimpse of their lifestyles on board. The idea, for example, of installing a sofa bed in the saloon for temporary guests was the direct result of our observation of owners who wanted to invite friends of family for a few days during their long cruises, without encroaching on the boat’s living spaces. The first time a sofa bed was used on a Swift Trawler 34 was in 2009. It was completely new and was only possible because of the boat's interior space. At the same time, we called on a great European brand of modern sofas to find acceptable answers to the mechanical, foam, weight and occupied space restrictions of a sea environment. These were carefully studied and the smart idea of keeping the sheets in place when the sofa was folded solved the tricky question of storage on board. This was only an example but it is a good illustration of how the collaborative chain works to transform an idea or a need into a well-designed innovation.